Former Blackwater Worldwide guard Nicholas Slatten leaving federal court in Washington in June 2014. He was convicted Oct. 22, 2014, of murder in the 2007 shooting that killed 14 Iraqis in Baghdad. 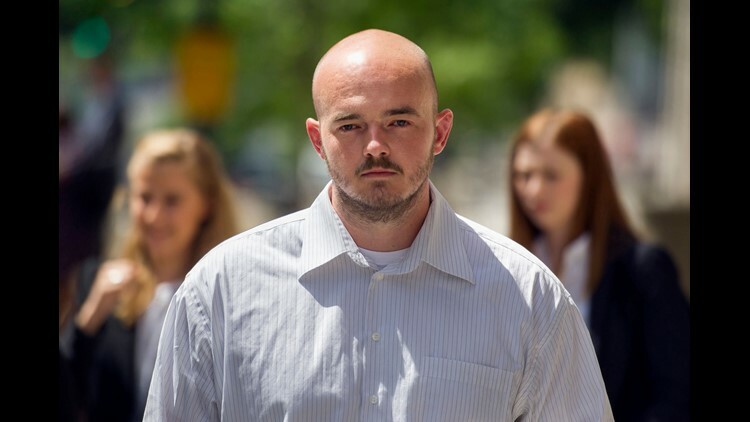 Three co-defendants were found guilty of manslaughter and other charges..
WASHINGTON – A former Blackwater Worldwide security guard will stand trial for a third time on charges that he instigated a mass shooting in Iraq more than a decade ago. Federal prosecutors in Washington said Friday they will retry Nick Slatten, 34, of Sparta, Tenn., on a charge of first-degree murder in the shooting that killed 14 unarmed Iraqi civilians and wounded 17 others, including women and children. Slatten’s second trial ended in a hung jury on Sept. 5. During a hearing Friday, U.S. District Court Judge Royce C. Lamberth set jury selection for the Slatten’s third trial to begin on Oct. 29. Assistant U.S. Attorney Patrick Martin told Lamberth he expects the trial to last about 15 days. Slatten’s second trial lasted five weeks, and the jury deliberated for 16 days but was unable to reach a verdict, leading Lamberth to declare a mistrial. Slatten will remain incarcerated for the duration of his third trial, Lambert ruled Friday, despite his attorneys' arguments that he has been "a model prisoner" and did not pose a flight risk. Slatten’s parents, Reba and Darrell Slatten of Sparta, Tenn., attended their son’s five-week trial and were back in the courtroom for Friday’s hearing. Darrell Slatten declined to comment afterward. Slatten was convicted of first-degree murder and sentenced to life in prison in 2014 for his role in the 2007 shooting in Baghdad’s Nisour Square, which happened during the war between Iraq and a U.S.-led coalition. The shooting heightened tensions between Washington and Baghdad and raised questions about the use of private military contractors during the war. A federal appeals court threw out Slatten's conviction last year and ordered that he be given a new trial. The deadly rampage in which Slatten was charged already has been the subject of investigations by the military, a congressional panel, the FBI and others. Yet 11 years later, details of what happened that day remain in dispute. Slatten and three other guards — Dustin Heard of Maryville, Tenn., Paul Slough of Keller, Texas, and Evan Liberty of Rochester, N.H. — were all former armed services members working as private security guards for Blackwater, now known as Academi. The guards’ Raven 23 security team was under contract by the State Department. On Sept. 16, 2007, their convoy traveled to a crowded traffic circle in downtown Baghdad as part of the effort to evacuate a U.S. diplomat. At some point, the guards opened fire with machine guns and grenade launchers. They say the shooting started only after a white Kia sedan lurched out of stopped traffic and approached their four armored vehicles. The men had received intelligence reports that a white Kia might be used as a car bomb, so they feared they were under attack. No evidence of a bomb was ever found. The government argued the guards opened fire without provocation on innocent Iraqis and used excessive force. Slatten, prosecutors contended, fired the first shots, killing the driver of the Kia, a young, unarmed Iraqi medical student named Ahmed Haithem Ahmed Al Rubia’y. The student’s mother, a physician who was seated beside him in the car, also was killed. But in statements to investigators, Slough said he fired the first shots, not Slatten. The statements were never presented to the jury during Slatten’s initial trial but were allowed during the second trial that ended in a hung jury.